When I first started the Design a Line challenge, I was excited about the prospect of creating pieces of jewelry that could be repeated, made more quickly, appeal to a variety of customers and be at a variety of price points. I was a jewelry making machine and this was going to be a piece of cake! Deciding on the line was a bit more challenging than dreaming about it, but really…how hard can this be? I made the decision to do something completely different than I usually make but still within the same “nature inspired” genre. I couldn’t believe that I was beginning to struggle with creating this line. Me? Struggle with designing jewelry? I was stunned. I began to look inward to determine what underlying issues I may be having with the idea of a “line” of jewelry that could be replicated. It seemed like a great idea and would certainly help with sales having a wider price range. But something about making more than one of an item just kept rubbing me the wrong way. Aha!! So THAT’s the rub. I really didn’t WANT to make a “line”!! This is why I couldn’t seem to move forward. After a couple of soul searching weeks, I watched a video that Brenda (B’Sue Boutiques) did on how to step out a large, one of a kind piece (now THAT’s what I’m talking about!) to smaller pieces using the design components. By the end of the video my “Eureka” moment came and I realized that I had the makings of a “line” all along!! I was making this way too hard! I took one of my larger silverware silverplate necklaces and began stepping back the components into smaller, coordinating pieces. Once I understood I was delighted to see that I didn’t have to compromise my “one of a kind” mantra at all. There were unlimited combinations that would make a line of jewelry that would be quick to make, still use my favorite components and didn’t have to be EXACTLY alike! So, without further adieu, I present my design line pieces…. This is the larger assemblage which I stepped back. 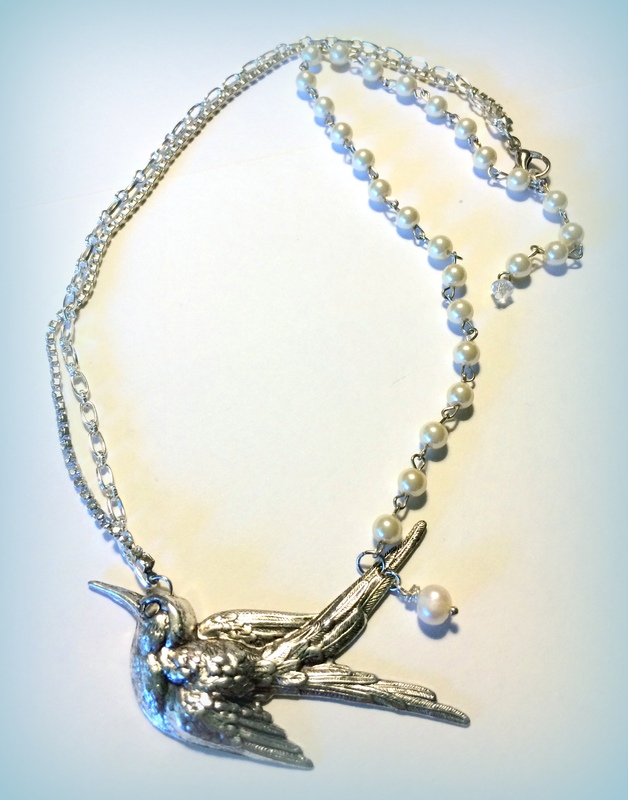 This is the first “stepped down” piece with the same bird component and pearls used in the larger assemblage. Faster to make and at a price point for most anyone. 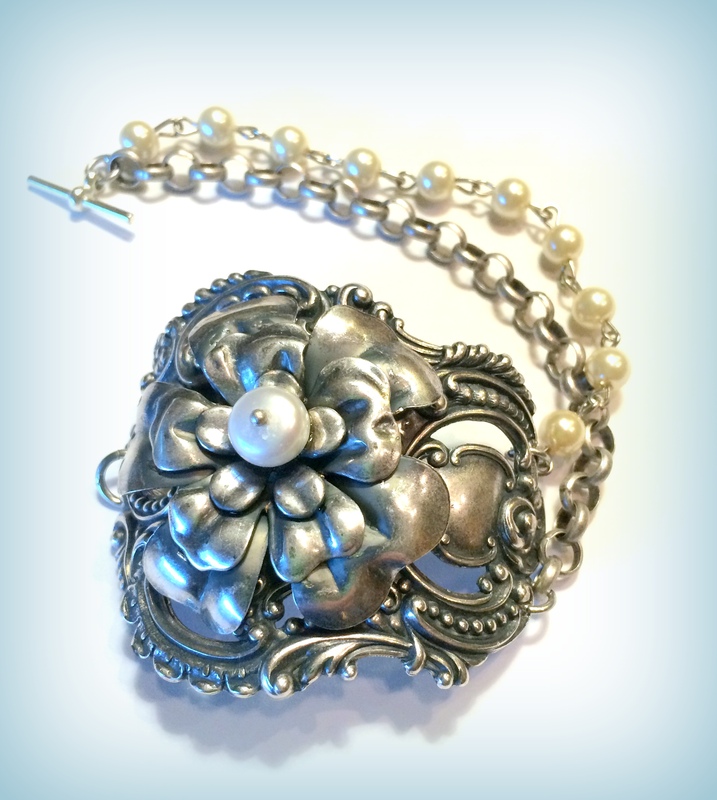 The second piece is a partial cuff bracelet, again with the same pearl rosary chain and flowers. 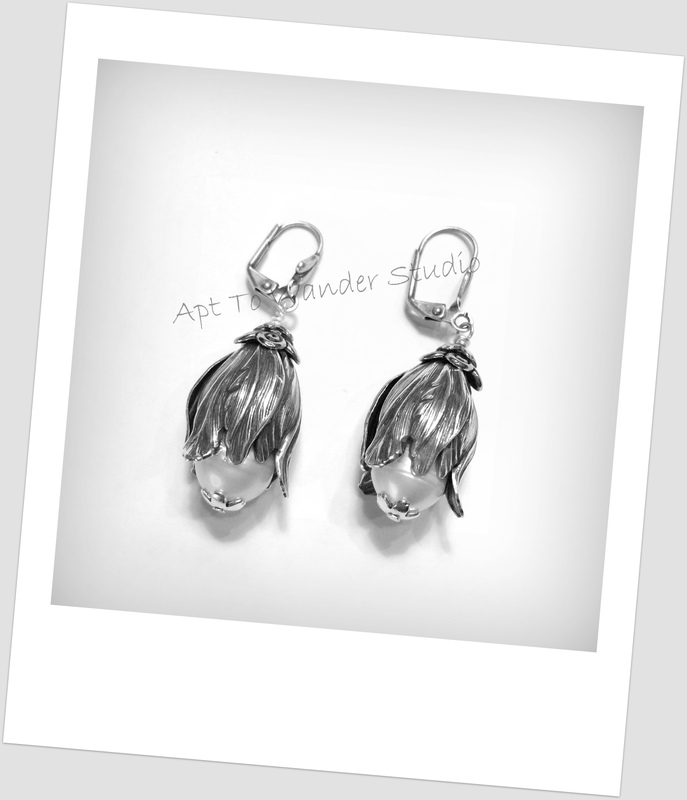 Next came a pair of earring using the silverware tulips also featured in the larger piece. Natural pearls repeat throughout all of the piece. 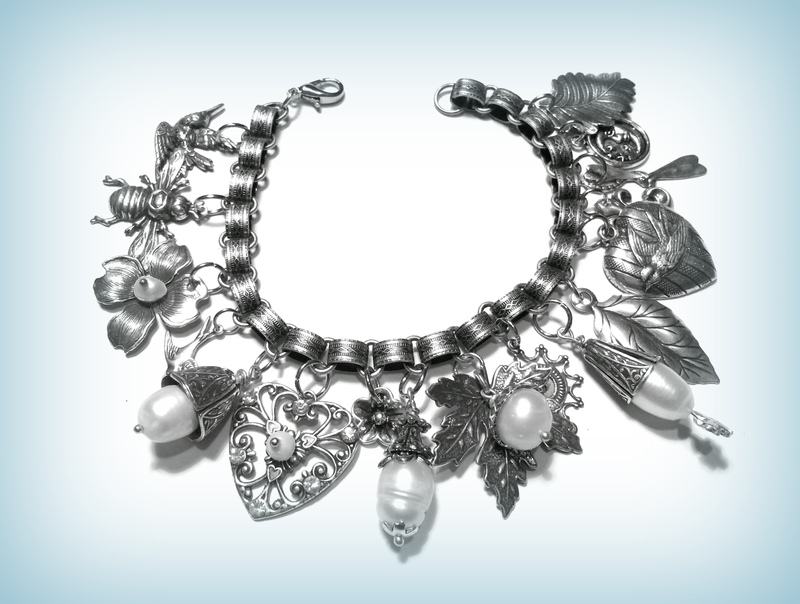 I decided to do a statement bracelet that would be at a higher price point as there are many silverware charms as well as large natural pearls. This would be at the higher end of the pyramid of price points. 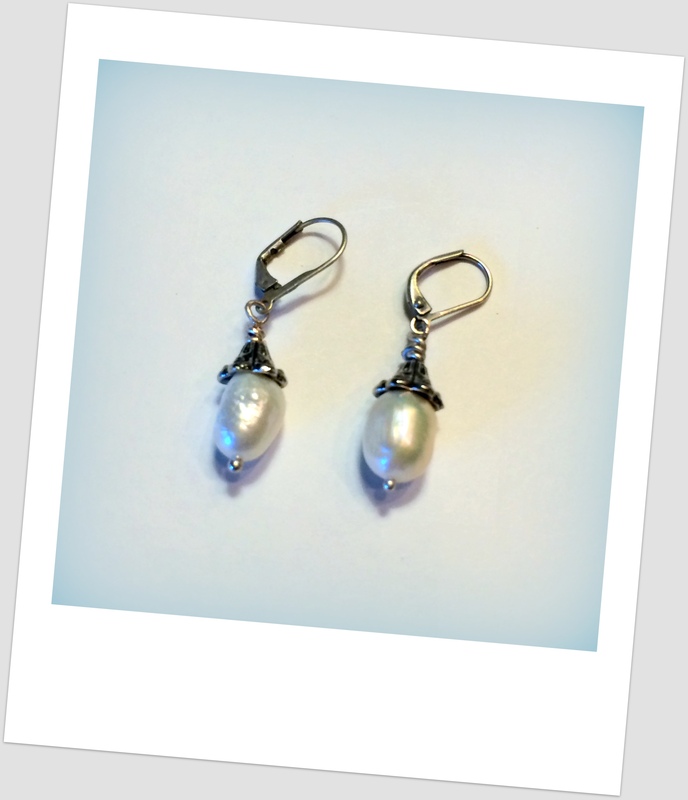 And simpler yet are the natural pearl earrings that not only coordinate with the other pieces but would be a staple in any woman’s wardrobe. I am so thrilled with the design line, but even more excited to be able to wrap my head around the entire idea of HOW to create a line. I began this journey not remotely interested in creating “duplicate” pieces for a line of jewelry only to find that I could remain true to who I am as an artist. Judy, your “aha” moment came in the form of a firecracker, lovely lady. This line is fabulous. I have a hunch you are going to see a surge in sales at your coming shows. And, I appreciate the honesty of your blog. What a wonderful, authentic read! Really really well done, Judy. Your pieces are gorgeous. Awesome looking pieces! Love that you made them from a statement piecr. Very cohesive. Very you. And you could do this with other favorite pieces and have another line! Your possibilities are endless. Bravo Judy! Love the direction your line has taken. I too sometimes wonder whether I was making it harder than it really is. Like you I’ve had my biggest aha moment when I watched B’sue’s video. Can’t wait to see your complete line now. I bet those sweet tulip pearl earrings sell very quickly! Thank you for sharing your struggle and how you overcame it. I am a big fan of the pearl earrings. Judy, Judy, Judy, well done! You and I are definitely soul sistahs! We had to get a grip on that “sameness” issue. It just took us a bit to realize that “same” did not mean “alike”, LOL. You definitely rocked the concept. Good work! “Making it Harder than it needs to be” should be my tag line! I appreciate reading about your struggles, especially from a design pro like you. Your pieces are always lovely, and I love your designs for your line! I’m glad you worked through it! Your design is so pretty, and very wearable. You nailed it, Judy! Excellent example of how to create a line without sacrificing your style and being true to yourself! ~Renee H.
Great post Judy. As always your jewelry is so beautiful and creative. Love your line. Look forward to s wing the complete line. Judy your jewelry is always stunning and I love your new line it’s gorgeous! XOXO! Beautifully done!! Each piece just as pretty as the last! Judy, thank you for sharing your thoughts on stepping out from one of a kind pieces. I am struggling with that as well. You have taken it to a wonderful level and your pieces are beautiful. Your designs are elegant and will have broad appeal. Great work! Very pretty. I had a similar aha moment when realizing that complex pieces were not for me. Thanks for sharing. Judy, you took the words right out of my mouth, I struggled the same as you. That video was such an eye-opener for me, that I had to post it on my blog. You always create beautiful pieces, this line is no exception! Lovely line and all so similar but so different. I love how you showed the step out from your large piece, Judy. Wonderful post!! You’ve definitely got the right idea. Your line is lovely. Judy, isn’t it amazing how we see our own foibles when we least expect them! I desperately wanted to make a line, but kept coming up w/ intricate pieces that took way too much time so they weren’t repeatable. 🙂 I watched that same video & read your comments on the site & thought “What am I missing?” Your work is gorgeous, whatever level you’re making. Great blog! I have the opposite problem in that I like to keep everything simple, so what am I going to do for a statement piece. What a wonderful post. I love the way you explained your aha moment with pictures. I have always loved your jewelry and the new line of simpler designs are just as gorgeous. Judy–I’m so glad that your aha moment came, because the line you’re creating is great…from the very simple earrings to the larger statement pieces. I can definitely see women wanting to buy several pieces to go together. 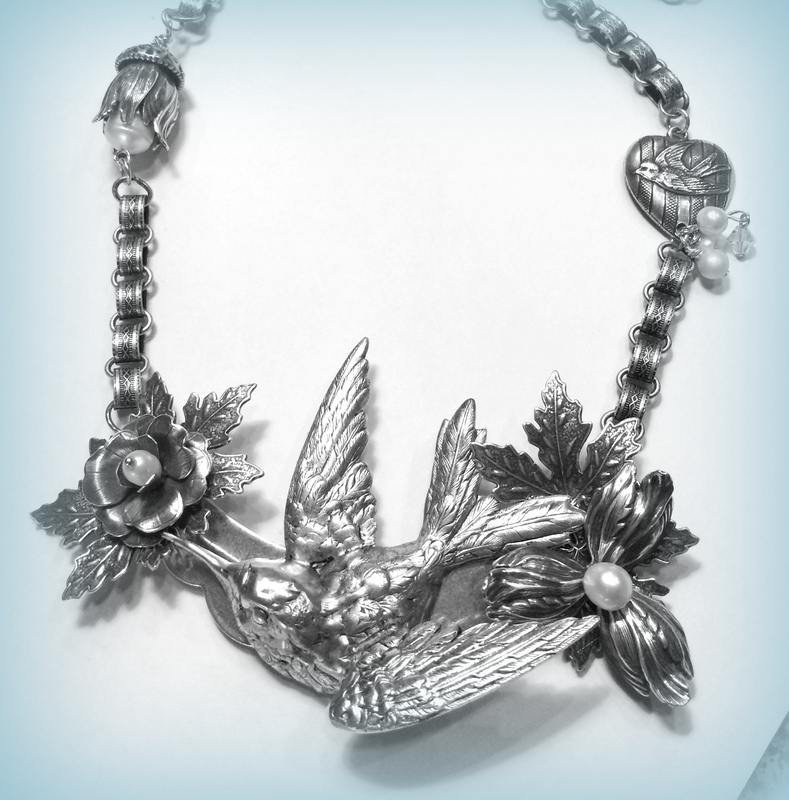 Wow beautiful silvery jewelry! You explain the flow of things so well progressing through the tiers with gorgeous examples. Judy love your line it is awesome. I think all your jewelry pieces always look like you, so you have a cohesive line/look and can probably duplicate anything you have ever made. that is the problem I am having. My line does not feel like me. Can’t quite catch my style, but Girl you have plenty of it.Cant wait for your next blog. Ok, Gloria….pick a larger statement piece that you have done that feels like your style. Then pick out certain components and create a simpler piece with those. Do it as a bracelet, earrings and necklace. You don’t HAVE to stay with the design line that you started with if it’s just not “you” and not your style. I changed from shells and brass to the silverware after I understood the whole concept. I’m going to do a large, shell/brass assemblage and then start stepping it back. Using this concept, I can make many “design lines”…all of them feel like “me” and are my style, even though they are different. I used to think I was the only one who made things harder than they needed to be. This class has been great on so many levels, including showing me I’m not alone in that tendency. I’m so glad you found a way to be true to your creative spirit while embracing the theme of the class. Your line is looking stunning. Awesome that you got it to all Gel! Keep up the fantastic creations! Your work is lovely, and as this challenge is bout stretching yourself as an artist-I think you have accomplished that for sure. The finish should be wonderful. Aha, someone who went through what I did! Great job on the cohesion of your pieces, and of course they are beautiful. That’s a given! Great Blog and beautiful jewelry! Love your style and writing! Judy, you have absolutely gorgeous pieces in your line. Great blog post! Thank you for sharing your journey , and you can totally see how your line is evolving from the OOAK kind piece down to earrings. Look forward to seeing what you reveal in the final hop! Thanks for sharing your thought process in working your way through making your line. I am just loving your designs. Awwww my friend you always take my breath away with your creations, I think your line is already an absolute success, well thought, well design and beautifully executed! Bravo! What a Great Post!! I love your entire line and it is very well thought out and beautifully done. A few of us have struggled with the “true to the artist in us ” issue! this is a great answer!!! Well Done! Be Blessed!!! I am so excited that you had your aha moment – your line so far is beautiful, I just love all the silverware silver plate and the pearls, can’t wait to see the rest! Your line is just gorgeous! The silverware just shines beautifully in your well designed pieces. I really think your pieces will have widespread appeal and if you are happy and satisfied doing them it’s a total win-win! Excellent work! I am sure you had a great feeling when you got through the struggle. Indeed, Brenda’s video and her notes helped us a lot. Silverware plating is my favorite as they just look gorgeous by itself. Your line looks so high end.